October 18th, 2013: Updated custom_maybe_activate_user() function to not rely on rgget() function. 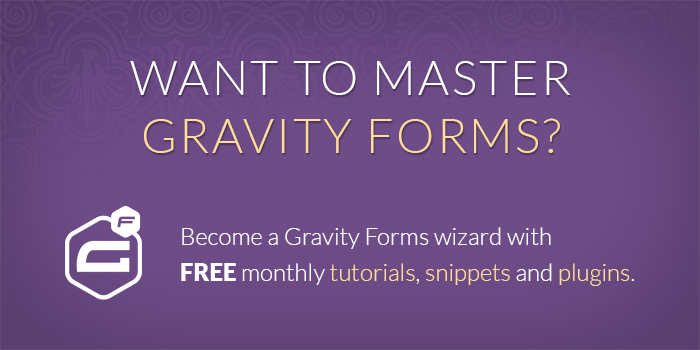 This article (and associated code) has been updated for Gravity Forms User Registration 3.0. If you have previously implemented this functionality and have upgraded to GFUR 3.0, please update your code with the latest versions below. 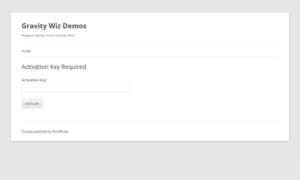 Want to customize User Activation emails? We’ve got you covered.. 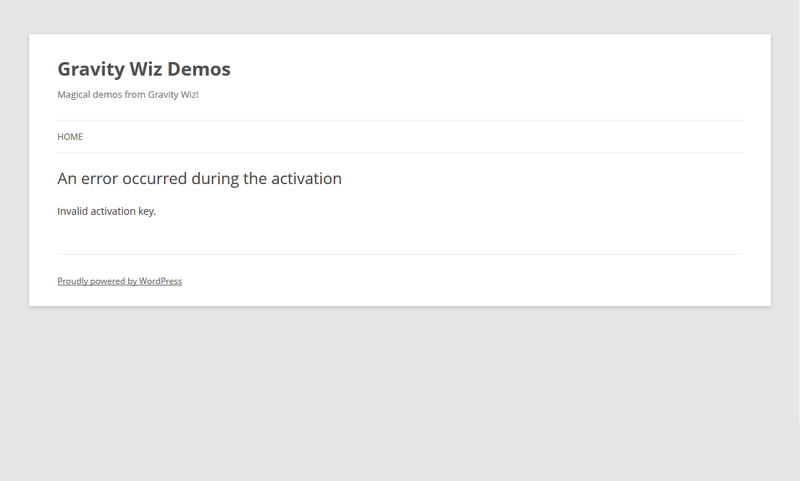 If you’ve checked out the latest beta for the Gravity Forms User Registration add-on, you might have noticed one of the awesome new features is “Pending Activations”. Here’s how they work. 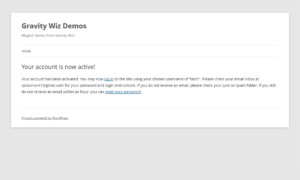 When the user signs up, instead of automatically being registered as a user on your WordPress site, an activation email is sent to the email address they signed up with. The activation email contains an activation link. When the user clicks this link and visits the activation page, they are “activated” and their user account is registered. 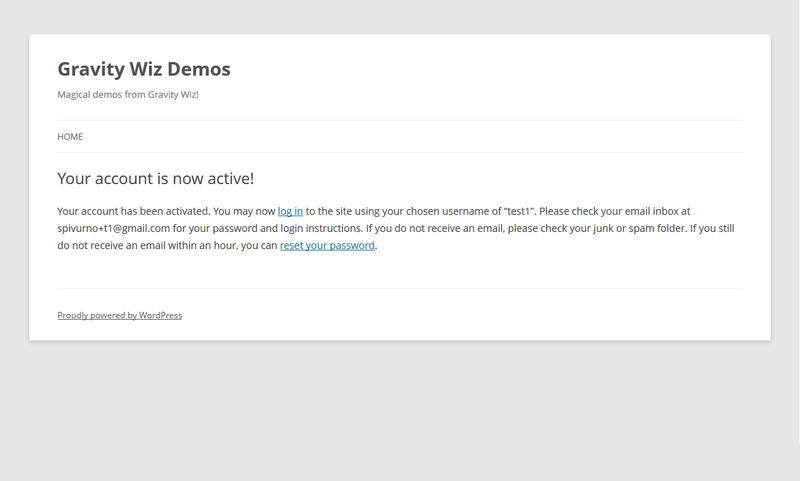 One of the first things you’re probably going to want to do with this new feature is customize the activation page. This is the page where users land after clicking the activation link in the activation email. 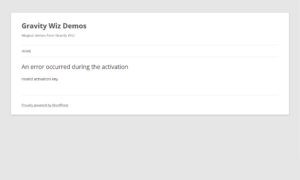 This walk-through aims to demonstrate how this activation page can be completely customized. At the most basic level, all you need to do here is find the activate.php file in the GF User Registration plugin folder and place a copy of this file in your theme folder. The issue with this is that the activate.php template really isn’t easy to customize. 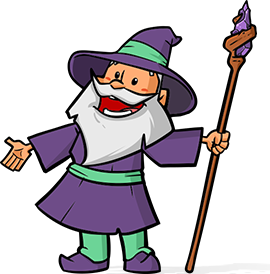 There are a lot of nested conditionals and special variables that you probably won’t understand without really digging in. To alleviate some of this burden, I’ve created a special version of the activate.php which you can download and include in your theme which is much simpler to customize. The primary benefit is that it takes 99% of the HTML output that lives in the activate.php template and moves it out to easy-to-edit template parts. Just click the “zip” button to download all the template files. 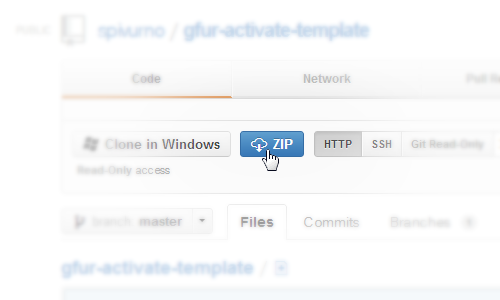 Once downloaded, unzip the gfur-activate-template-master.zip file. Inside you will find a gfur-activate-template-master folder. Rename this to “gfur-activate-template” and move this folder into your theme folder. There are several different “views” or “parts” of the activation page. This is the default view that a user will see after clicking the activation link in the activation email. This view is handled by the activate-success.php template part. Occurs when a user attempts to activate an activation key which has already been activated. This view is handled by the activate-error.php template part. If anything goes wrong during the activation (i.e. bad activation key, username already registered, etc), this view will handling displaying the error. This view is handled by the activate-error.php template part. It’s quite unlikely that users will see this view since the activation key is passed in the activation link; however, for the sake of completeness, this view is what the user will see if no activation key is passed in the activation link. This view is handled in the activate-no-key.php template part. If you’re using the GW Activate Template files and followed the instructions above, you won’t need to change this snippet at all. It’ll just work. Otherwise, you will need to change the $template_path variable to point to the location of your own custom activate.php file. Is it possible to customize the activation email sent to the user? Yup! We’ve written a tutorial with step-by-step instructions on how you can customize the user activation email. Check it out. That’s it for now. Give it a go and let me know how it works out of you. I’m eager for any feedback you have! So I have followed all the instructions, but the activation page keeps opening as my homepage and I can’t figure out how to change that. I’m using BuddyPress and Gravity Forms User Reg on a MultiSite installation with the theme Kleo (sorta popular theme) and I can’t seem to change the page that the activation goes to. I really wanna buy the GW Perks, but I sadly can’t afford that right now, so I’m trying to find a way to make it point to another page. Hm, if you’re confident you’ve configured everything per the instructions in the tutorial and it’s not working, there is probably a theme/plugin conflict. You can try testing for that. Unfortunately, there just isn’t much else we can do via free support. This is an issue that would require a WP login so we can dig into your configuration and see what’s going on. i have an order form where the client inputs details of the product and also personal details that should be captured by user registration addon.the client submits the order and they should be registered. when the user logs in at a later time, they should be able to see their order details also show pending orders or something close to that.. Sounds like you want Gravity Forms User Registration Add-on and maybe something like Gravity View. David, I’m considering getting your Gravity Forms Better User Activation plugin and have a question: on a multi-lingual buddypress site, I’m creating user registration forms in different languages. Can different custom activation pages be assigned to different user registration forms? (So that the activation pages appear in the appropriate language)? Thanks in advance! This is really useful, just what I was looking for! Are there any related instructions on getting this code to use theme stylesheets? It should automatically load the theme’s stylesheets if your theme is configured in a traditional WordPress method. 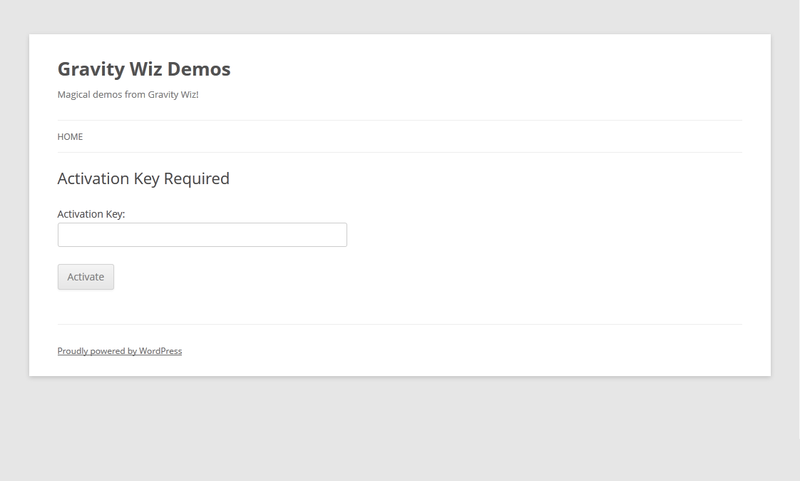 If not, you might be interested in trying our upcoming plugin, GP Better User Activation. It lets you use a WordPress page as the activation page which is loaded by your theme. Feel free to drop us a line via support if you’re interested. Thanks. Looks like the theme uses a lot of shortcodes to set up things. Not good. Sorry, I should have asked: *When’s the new plugindue out? *Will it be part of the Perks package? Glad you found a solution. For other users needing to do the same thing, Gravity Perks offers GF Auto Login. our users dont like login first , just disable this error. for example if user already registered then just update their posts and if they dont registered automatically, register now automatically. I am struggling getting this to work. I think that it is probably a path error. I duplicated all of the empty directories in my child theme and placed your downloaded files as directed. I prefer identical file structures when I am troubleshooting issues at a later date. I have tried every possible path without any luck, I keep displaying the default account activation page. I simply placed my name in theprintf line in activate-success.php file to eliminate any possible errors. I am using the Virtue theme by Kadence Themes but I cannot see how the theme would inferfere with the default account activation page. A little more information I place the code below in my functions.php file as directed. This is where I have been changing the $template_path by trying every possibility of the full path to my activate-success.php file. As a first step, I would complete the tutorial with the instructed path. If that works, you’ll know it’s just a pathing issue. This is a continuation of a previous request. I have tried the original supplied path without success. I have also tried all the variations on the path by adding the directories in front of ‘/gfur-activate-template/activate.php’. Could my failure to get your code to work for me have anything to do with it being used in a child theme? I’m not sure about this because I do not know how to inspect it. I think STYLESHEETPATH is returning the path to the main theme not the child theme. I could be WAY off course, your help would be greatly appreciated as I am still learning. I have tried to hard code the path to my child theme all the way down to the acrivate.php file without success. Still no joy, I cannot get it to work. I simply cannot get the module to work, I know I am doing something wrong. I just don’t know what to try next. There are no other activate.php files in the child theme. I have included my child theme’s functions.php contents in the code section. I have had no luck with that either. I am a complete loss. I’ve tried everything I know but I’ve gotten nowhere. I really could use some direction. I am completely confused. I have been working on this the best part of the day and I have not gotten anywhere. I would expect that code to work. If it’s not working, we’ll have to dig in. There are two ways we can do this, a) you can use our installation service or b) we have a perk coming out soon that handles this functionality without any code. If you’d like to be the very first user to try this, pick up a copy of Gravity Perks and drop us a request. Hi, I’m not a coder, Gravity support sent me to this tutorial as my activation page is broken, it ignores our Avada theme. I have placed the files folder to the theme folder, then replaced the functions.php code with the short code supplied, but the website goes blank, showing no content at all. Had to place the original functions code back. Adding the code does nothing (without the first line of code, otherwise I get error). So, our activation page is still a mess and gravity support simply told me to contact you. Could yo help, please? Thank you. Hi Sasha, first stop is the Snippet Troubleshooting doc. If that doesn’t help, we have a Snippet Installation service. I am using the Divi theme and although your customisation code works well (thank you!! ), I am having an issue adding the header. When I echo the template type, it is giving me ‘Blank Template’ (divi has that template and one other with header/footer) which by default gives pages without header/footer as you would expect. What I am not really sure of is why it thinks it is that template. I tried various ways to add a template name to your activate.php file e.g. by adding a custom name as a comment at the start of the file, but ‘template type’ always comes out as ‘Blank Template’. 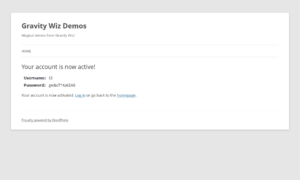 Any idea how I can override this so that our activate pages do have the header and footers? Thanks for all your very great work. p.s. sorry for posting this on another page of yours, it has been a long day! Were you ever able to find a solution to this problem? It seems to be unique to the divi theme and displaying headers and/or footers as modules on template pages. We’ll definitely take Divi into consideration when we create a plugin for this functionality. This seems to have stopped working for me. It was working perfect and now when someone registers and clicks verify link the page they are sent to is broken. It looks like a fatal error is occurring on the first page load. Enable WP_DEBUG (there is a section on that here) and let me know what the error is. How can I change the page title of activate.php – it seems to pull in my blog home as the pages title. Any chance of making activation as standard word press page-templatename.php ?? On – activate-success.php How do I email the user their password? Could it be included in the activation email? or sent by email to the user after activation? Hi Nat, you should be able to change the title via the wp_title filter. I don’t have ready solution for sending the password to the user on activation. We do have plans to make this available as a perk in the future. That version would allow you to configure the activation page as a standard WordPress page and give complete control over the contents of each possible scenario (success, failure, etc). Dont know why, but this code crashes my site. I use a Code Snipets plugin to insert the code. thanks a lot. I was able to get my site working again, but the snippet doesn’t work on my site. I will contact the theme support today and see if they can help to fix it, hopefully, they can (I use Total Theme). The problem was – I have added the snippet into the functions and the site handles some extra hooks for added code. Additionally, as the snippet doesn’t work I thought the code placed wrong so I was trying to dig deeper and place the code in some crazy variations :D that’s why the site crashed at the end. In regards to the snippet not working still… this snippet won’t make anything look different when it is installed by default. Try changing the templates (like activate-error.php or activate-success.php) to make sure that you aren’t seeing your changes. But wait a min you are writing above that the default view should look like this, but in my case its still ugly, it is definitely doesn’t look like this. So I am again doing something wrong I guess. What I mean is that it will look like however it looked before you installed the snippet. It just provides the ability to change the look. It won’t suddenly look like the screenshots above unless you’re using the TwentyTwelve theme. But if you’re using the TwentyTwelve theme, it will look like the screenshots above even without the snippet. then I have to work on the CSS so it will look better. I’m at the same pos like the guy below. Trying to get that running on a specific site. But in my case you $url = website etc doesn’t work. I followed the instructions and implemented the custom registration on my website But when I click on the registration page I get a blank page and no error. The error i get is: Fatal error __clone method called on non-object …ocs/wp-content/plugins/sitepress-multilingual-cms/sitepress.class.php 282 which gives me no information on how to fix this. 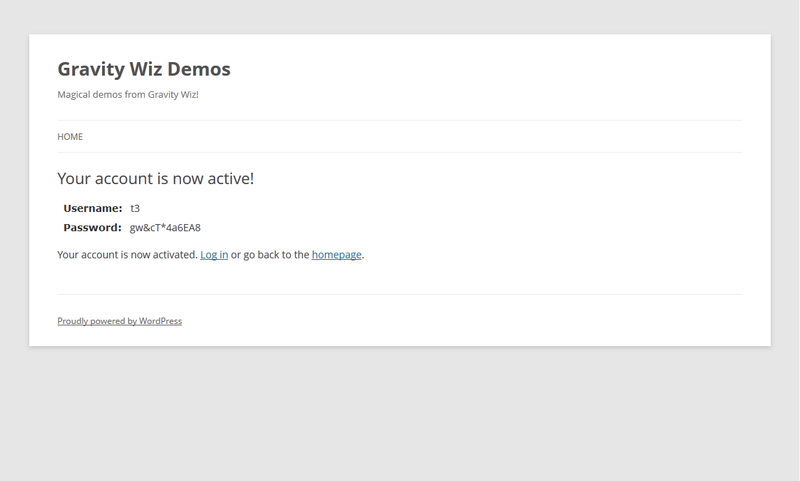 I think the issue is on the activate-success.php I am using WPML on Kleo Theme with Gravity forms registration addon. Is there a way you can help me on this? Hi Merxhan, I would start with a theme/plugin conflict test to rule out any other plugins causing issues. More information here. Does GF user registration work with the password reset option? How can I solve this issue? Hi Eric, I’m assuming the reset link needs to be dynamically generated with a nonce of some sort for security. If you’d like to hire us to help with this, get in touch. does this work with a childtheme as well? I followed the steps above but still have the WordPress standard page when following the confirmation link sent via email. Into the ‘functions.php’ that´s placed in my childtheme folder I copied your snippet. Hi Sascha, it sounds like you understand how this should be configured. It’s not clear to me what would be going wrong. Are you seeing any errors? everything works fine! Because the text on the activation page appeared in german I thought this must be the WP standard page. My fault. After editing the GF activation page I found out that the template is used like it should. Thanks for your time. Yes :) But there´s one more thing… I customized the php-files but no CSS does take any effect!? How can I achieve this? Are you CSS files being included? Are the correct classes in place per your CSS file? I put the CSS-file in the same folder and include it with the link-tag in the html-file´s head. But even CSS put directly into the div-tag doesn´t take effect. Sounds like one of two things; either the template isn’t loading or there is a theme/plugin conflict. Isn´t there a way to simply redirect to a page I can create with WordPress? It would be great to lead the user directly to the website including the menu, sidebar and all that stuff instead of displaying a link saying ‘Activation successful. Please log in here’ or something. Is there a way to achieve this? Sure, it’s possible, you would just need to developer a custom solution to handle it. This is more or less how the perk version of this snippet will work. No ETA on that, however. How would I direct the success response to a page that wasn’t my front page? I have a large slider on my front page and I’d rather they saw the success message on a page without my slider. Try changing the $url to the exact URL you want. Hopefully this helps anyone else having issues where it appears their custom html in the activate-*.php files isn’t working. Basically, the theme name is getting included in the $this->template_folder variable so every get_template_part() was failing in activate.php. If you don’t have your activate php files in a folder you can just fix the get_template_part calls. David – I also submitted an issue on github. And…I totally forgot to thank you for this awesome bit of code! It’s extremely helpful! I see they updated get_base_path method to public from protected. Does this require us to declare this now in activate.php? Any ideas? Are you using the latest version of the code? It is available above. This works great BUT as you mentioned in above comments it looks like default template. How and where should we modify the code to include our active theme header and footer? Hi Vainucleo, it sounds like you might not have included this correctly. It should automatically pick up your theme’s header and footer.